A caring funeral home that serves bereaved families in Uddingston. My family and I would like to thank David for all his help and support at this very difficult time,would highly recommend him couldn't do enough for us..thanks again from the Nicol family . very professional throughout the whole difficult process,nothing was any trouble for them,made the whole business comforting and respectful. This funeral home in Uddingston is proud to be a part of Scotland’s largest independent co-operative, with a rich history spanning over 150 years. Scotmid is proud to be at the heart of the local communities it serves, their Uddingston office is situated on the end of the Main Street, opposite the junction with Lower Millgate. There is plenty of off street parking available. Uddingston is still home to the famous Tunnocks Factory. There is still very much a close community in Uddingston, which they are proud to be a part of. We were sensitively treated all through the process and consulted regularly to check everything was right. It helped ease our pain knowing that things were being taken care of. Thank you for your kind and positive review, we are glad that David, Mark and the rest of the team at Uddingston helped to ease things. Thank you. 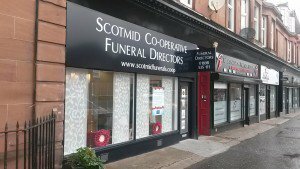 Scotmid Funerals, Uddingston will provide you with a free obituary as part of their service.